Cleanliness and layout is first class and public transport is excellent. The SunLodge Jungle is just as stylishly furnished as the SunLodge Safari, but is somewhat smaller and does not have its own bathroom facilities. There are two bedrooms and the tent is suitable for 5 people. The living area is 30 m² including the wooden patio. Camping is one big adventure, especially for the children. 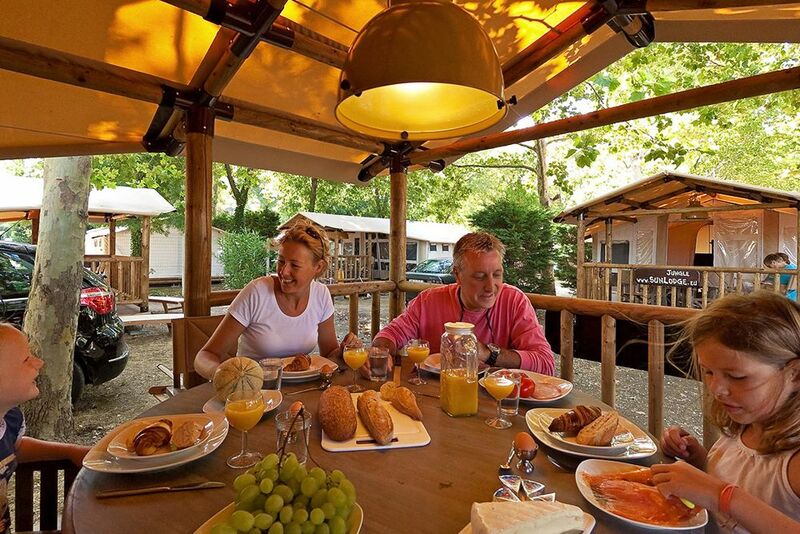 This SunLodge accommodation can therefore be rented at two child-friendly family campsites in France. It really couldn’t be easier. The lodge tent is completely furnished, making packing your bags simple. However you still have large beds, a covered patio and a kitchen unit. Maybe you’ve already heard of 'glamping'; luxury camping. This lovely lodge tent more than qualifies. From £ 169 a week! This SunLodge can be found on as many as 25 campsites across 5 countries. The luxurious, designer RoyalLodge tent - unique regal accommodation! This tastefully designed accommodation offers space for up to 4 adults and 1 child. This adventuresome lodge tent has its own heating making it ideal for the low season! Do you have a large family? The SunLodge Aspen is suitable for 6 people!